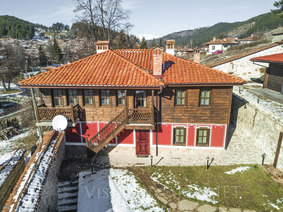 Location: Red House Guest Houses are located in the town of Koprivshtitsa 100 km from Sofia. Red House is a complex of 2 guest houses with a tavern and a barbecue. - 2 double rooms with king size bed, 32 '' LCD TV, Wi-Fi, shared bathroom and toilet with free toiletries. Features: Tavern with kitchenette, fireplace, sofas, TV, free Wi-Fi in the complex.